Karoki and Seko backstage before the announcement. In the wake of Monday's Japan Industrial Track and Field Association press conference formally announcing the corporate federation's new Project Exceed 100 million yen [~$1 million USD at normal exchange rates] bonus program for a new Japanese marathon national record in the lead-up to the 2020 Tokyo Olympics, the DeNA corporate team held a press conference Tuesday at the DeNA offices in Shibuya, Tokyo to announce that its star runner, 2015 World Cross Country Championships silver medalist Bedan Karoki, has filed the necessary paperwork to transfer his citizenship from Kenya to Japan. "Please look kindly upon me as I strive to bring Japan gold," Karoki said. Appearing at the press conference alongside Karoki were DeNA CEO Isao Moriyasu, executive head coach Toshihiko Seko and assistant coach Tomoaki Kunichika. Moriyasu told members of the media, "Karoki has lived in Japan for nearly ten years, graduated from a Japanese high school, recently passed the highest level of the JLPT Japanese Language Proficiency Test, and is a productive member of our team, company and society. A large part of DeNA's innovative workforce is made up of talented, hardworking immigrants, people who now make up a significant percentage of Japanese society. It is time that we rethink what it means to be Japanese. DeNA prides itself on its forward thinking and cutting edge innovation and we are likewise proud to take this step and welcome Karoki as one of our own." Seko commented, "There is a great deal of talk that we need to look to what the U.S.A. is doing right in order to win medals. Most of their best athletes are immigrants, and their success has motivated their best native-born athletes to try harder. Looking at that example it's easy to see that the time is right to take this step. Karoki is the most talented athlete I have ever coached. I hope that he will be able to achieve what neither I nor any of the others I have coached were able to do and win an Olympic marathon medal for Japan." Kunichika discussed Karoki's development plan, saying, "The ultimate goal will be a gold medal in the marathon at the 2020 Tokyo Olympics. If his citizenship is processed in time for the 2016 Rio de Janeiro Olympics the focus there will be on the 5000 m and 10000 m, but in any case before moving to the marathon he will work to deliver Japan's first-ever sub-13 5000 m, sub-27 10000 m and sub-hour half marathon. We hope that other Japanese athletes will be inspired to follow his lead." Although he will not change his name, as part of his transfer of citizenship Karoki will take a kanji reading of his birth name. "His family name will become 黒木 [Kuroki, black tree]," revealed Seko. "In light of his good looks we considered 美男 [Binan, handsome man] for his given name, but instead chose 美談 [Bidan, beautiful story] as we hope that by the time his story is finished it will indeed be a beautiful one." 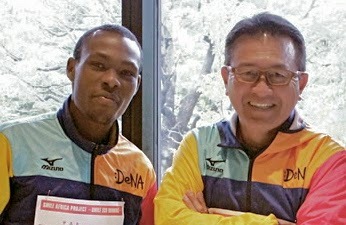 Former Yamanashi Gakuin University star Stephen Mayaka took Japanese citizenship following his retirement, but Karoki is believed to be the first Kenyan to transfer nationality to Japan while at the height of his career. 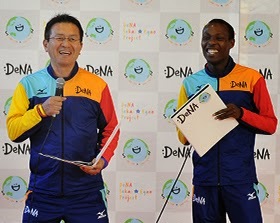 2013 Fukuoka International Marathon winner and Osaka World Championships 10000 m bronze medalist Martin Mathathi (Suzuki Hamamatsu AC) is also reported to be in the process of transferring his citizenship to Japan and will take the name 鈴木マサシ [Masashi Suzuki]. Update: This was an April Fool's Day story. Neither Karoki nor Mathathi have officially announced plans to become Japanese citizens.